In short: How to embrace fully your creative potential? Which are the social and individual obstacles for your art to unfold without restrictions? 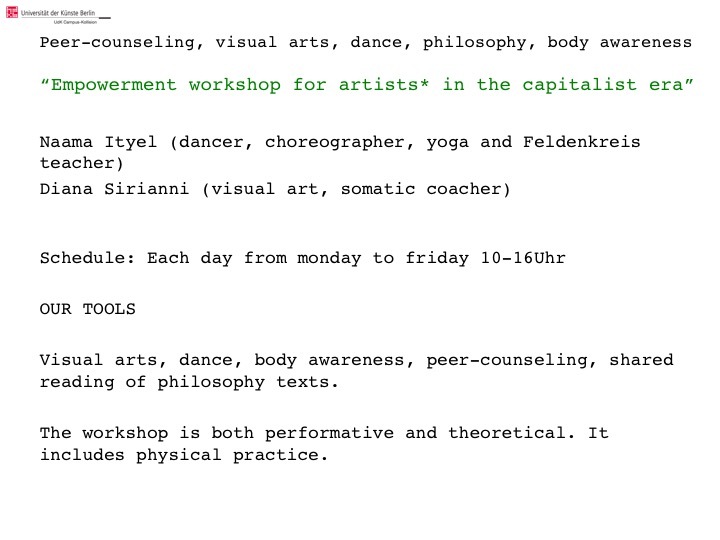 The workshop „Empowerment workshop for artists* in the capitalist era“ is designed by two young women artists for other artists*. It is the natural development of the workshop „Collage as an Attitude“ that we offered at the UdK in 2015. Shifting through visual arts, philosophy and dance practice, we aimed to present collage not as a technique connected to a specific visual discipline but as a form of structural thinking, a tool to recognize ever-changing structures of everyday life, „normalities“ that we are unawarely reproducing and that, once identified, offers us a greater clarity both in our art as in our life. The current workshop features also a structural approach but has more specific focus. Its goal is to reflect collectively about our condition as artists* in this present time and place and connect to our creative energy. We want to analyse which obstacles exist for our creativity to unfold in its fullness and what can we do to remove those limitations. The first thing is to raise an inner awareness and we will investigate together which are the steps to undertake and how the connection to other artists can enormously support us in this process. Our background assumption is that artists* are oppressed by the capitalist society from many points of view. In a materialistic and utilitarian world, art is generally seen as something useless, unproductive or optional. The domain of art is restricted to an „art world“, disconnected from the rest of society and very hard to access. If you want to be inside, you need to be hyper-productive, successful, provocative with your art and still integrated in the art social network, which is disciplined by power relations and tough rules of inclusion/exclusion. The contradiction in which you as artist* live is wide and complex. You are supposed to be a „free spirit“, but then you need to listen to the economical promises related to grants, commissions or sells which would make your existence a little less precarious and let you feel more wanted and recognized; in order to access those privileges you have to submit yourselves to bureaucratic normalization (the „jungle“ of applications), while forced competitions will prove you being „more“ or „less“ interesting than other artists*. The system trains you to be harshly critical to other artists* and to yourself, in a way that most of the time is destructive and isolating. It also makes you work for a small elite of people as audience and potential supporters for your activity , excluding the vast majority of people from the artistic communication. This description is just an example of artists´ oppression. There are many other aspects of oppression that we experience as artists*, many of which aren´t only or exclusively related to capitalism, but also to other forms of oppression as racism, sexism, classism, ableism, adultism and unfortunately many other -isms. 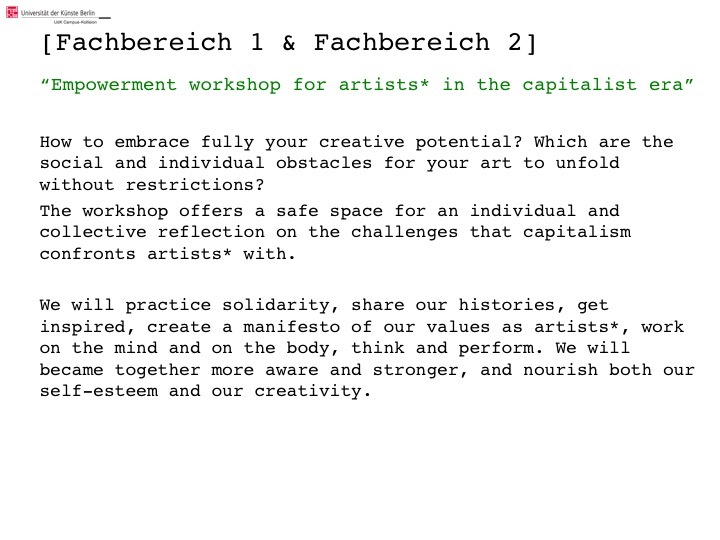 In this workshop we will focus on the capitalist aspect of artists oppression, while actively taking into account the other aspects, since it is all anyway connected and since we want to provide a safe space for everybody*. Capitalist oppression damages artists and it is opposed to art´s vocation to celebrate values as humanity, freedom, truthfulness, solidarity, equality. Many people lose their motivation of being artists and their love for art because of this pressure. Other people keep being artists but need to spent a lot of energy to fight against it while their well-being and their art gets seriously undermined. The art school is a place where all these structures are reproduced and we think it is really important for young artists* to thematize them and get some tools to emancipate from them. The workshop will be a space to share our experiences. The exchange and the interaction will be facilitated using different methods as the sharing of autobiographical experience, peer-listening, shared reading of philosophical authors as „The Burnout Society“ by Byung-Chul Han. We will use examples from the visual art and from the dance art field to highlight the relationship between the social and artistic, the structural and the superstructural, showing how strong is the correlation between different artists*´ lifestyles, their social condition, their political placement and their artwork. We will look at some artists that openly challenged the status quo and others that seemed to accept it more. And then we will turn the same question to ourselves and ask: How does social conditioning influence my art? Eventually we will take inspiration not only from the artists biographies but also from the artwork itself and will enjoy together empowering and de-normalizing art, strengthening our trust in our creativity and intelligence. The social structures of oppression that we carry with us don´t express themselves only intellectually but are also deeply imprinted in our emotional and physical behavior. That is why we want also to use our emotions and bodies as a material which we can work with and see how on this level we can act in order to uninstall patterns that disconnect us from the present and ourselves. The workshop will start within a certain frame and evolve organically according to the reactions and the questions emerging during it. It is open to all Studiengänge and lives out of the participation of the students*, which are warmly invited to an active and first person-commitment. Diana Sirianni (Rome,1982*) is a visual artist and a somatic coacher. Meisterschülerin of Gregor Schneider at the Universität der Künste Berlin in 2013, before moving to Berlin ten year ago she studied Philosophy in Rome, Italy. Her artistic practice crosses the fields of painting, sculpture, photography, architecture and investigates visual and spacial systems of reference and meaning. Whereas at the beginning it was centered on a reflection on the medium and its structures, in the last three years she focused her attention in the investigation of social structures of power in the art world and in society in general. She displays her work in museums, galleries and project spaces but also outdoor and illegally as a form or re-appropriation of public space and is interested in collaborative projects. She practices co-counseling, a grassroot method for self-development and social change, and body awareness through dance, yoga and bodywork and is herself a somatic coacher, an activity that complements financially and humanly her engagement as an artist. She started an artistic collaboration with Naama Ityel two years ago, realizing workshops about visual, space and body at the UdK “Collage as an Attitude” and “Contact-Lenses” at the museum ZKR (Zentrum für Kunst und öffentlichen Raum). Last Exhibitions: “Zwischen Räume”, ZKU Berlin (2017),“Gewagte Entgrenzungen”, Kunstverein Göttingen,“Drift”, Städtische Galerie Delmenhorst (2016), “Konkret mehr Raum!”, Kunsthalle Osnabrück. “House Hold Fold”, Patrick Heide Contemporary Art, London. “Raumhippogryph II”, Art Cologne, New Positions, featured by Philipp von Rosen Galerie (2015). “Raumhippogryph. Ein wirklich Wesen und kein Zauber war”, Figge von Rosen Galerie, Cologne. “Neubarock”, Cappella Santacroce-Aldobrandini, Rome. “Desorden en Palacio”, Italian Cultural Institute, Madrid (2014). MARTa Herford Museum “Ruhe Störung. Streifzüge durch die Welt der Collage” (2013). Naama Ityel was born in Tel-Aviv 1987. She graduated in the High School for Arts in Tel Aviv “Mate Asher Dance Academy“ and SEAD (Salzburg Experimental Academy of Dance); danced for “Emanuel Gat Dance Company“, Colette Sadler, “Dana Ruttenberg Dance Company“, “Angela Vadori“, Shai Faran and more in Israel and Europe; created a piece for “Mate Asher Dance Academy“, co-choreographed the piece, “One E on Edge“, that premiered in Tanztage festival; collaborated with LaborGras, co-choreographed the piece “Do you come here often…?“, performed in Tanzimpuls, Austria. Choreographed the solo „Tracy“, performed in “Lake Studios”, in „Contact energy festival“ , in “Acker Stadt Palast” and won the third price and the critics award in the „Festival of choreographic miniature“, Belgrade. 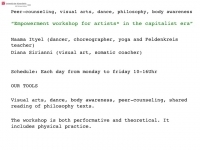 Since 2011 she is based in Berlin and works as a dancer and as a dance, Yoga teacher and a Feldenkreis practitioner. In 2015 she leaded with Diana Sirianni a seminar in the UDK in the frame of the Studium Generale.